(Nanowerk News) Electron states in solids are responsible for many material properties, such as color and electrical conductivity. However, because of their confinement within the crystal, it is very difficult to study the quantum physical properties of the electrons in detail. Konstantin Bliokh and Franco Nori from the RIKEN Center for Emergent Matter Science, in collaboration with researchers in Austria, have now successfully measured free electron properties equivalent to those in solids for the first time using vortex electron beams formed by a transmission electron microscope ("Imaging the dynamics of free-electron Landau states"). Figure 1: A transmission electron microscope creates beams of electrons with different vortex properties (m) that are focused on an observational plane (black) by a magnetic field (red arrows). A plane (gray) is used to cut off parts of the electron beam to analyze electron trajectories with different angular rates (ω). The quantum electron states in a magnetic field are known as Landau states. The signatures of these states in solids can be measured through electronic conductivity experiments, but the specifics of electron movements and their rotational dynamics within a crystal have been impossible to observe directly. Bliokh and Nori instead aimed to produce Landau-state electrons in free space, where their detailed properties could be observed more easily. To achieve this they used a transmission electron microscope to produce nanometer-scale vortex beams of free electrons. In combination with an external magnetic field, the parameters of the vortex beam, such as radius, could be set to correspond to the different Landau states. To examine the rotational properties of the electrons in the magnetic field, the researchers cut off parts of the beams with a sharp edge, and moved this edge along the vortex. This revealed the internal rotational dynamics of the electrons, including the structure of their quantum trajectories. 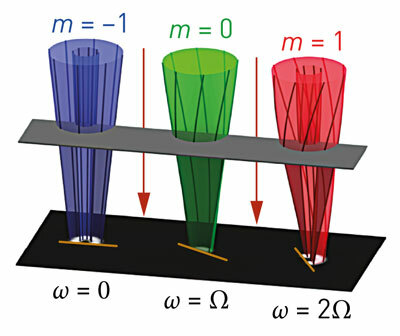 This investigation revealed that the quantum electrons exhibit rotations with three different angular rates determined by the vortex quantum numbers of the Landau states (Fig. 1). This is in sharp contrast to the uniform rotation of classical electrons in a magnetic field but consistent with recent theoretical predictions.